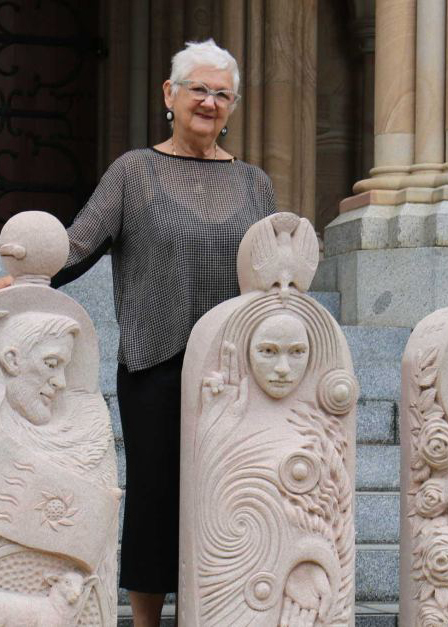 Born in Brisbane, Queensland in 1940, Rhyl Hinwood’s professional career as a sculptor began in 1976 at the University of Queensland where hundreds of her carvings in the Great Court are now listed on the Registers of the National Estate and Queensland Heritage. With over forty years experience, Rhyl has worked almost exclusively on the design and production of over seven hundred commissioned public artworks for institutions, the churches, corporations, organisations, federal, state and local governments as well as for private clients. Undaunted by large projects, Rhyl recently designed and carved an historic Helidon freestone and bronze frieze eleven meters long for Monte Sant’Angelo Mercy College in North Sydney and a three meter high granite and bronze Celtic Cross for the Holy Spirit Seminary at Banyo Brisbane. Following on site carving in the Benefactors Gallery of St John’s Anglican Cathedral in Brisbane, Rhyl has designed statuary for the West End façade and at the end of 2015 six sandstone statues are now completed.